Heat oil in an exceedingly giant, slippy pot or Dutch kitchen appliance till shimmering. 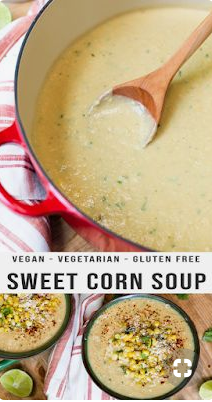 Add corn kernels, cut onion, 1/8 teaspoon flavoring, 1/2 teaspoon kosher salt, and 1/2 teaspoon black pepper. Cook over medium-high heat, stirring oftentimes, till onions ar soft and corn is lightweight golden brown in spots, concerning ten minutes. Add garlic and cook till odorous, 1 minute. take away 1-1/2 cups of corn mixture from the pot and put aside. Stir broth and half dozen stripped corn cobs into the pot, scraping up the brown bits on all-time low. wake up a boil, scale back heat, and simmer for twenty minutes. Use device to get rid of corn cobs from pot and discard. Stir soured cream and Cotija into the soup. Transfer soup to a liquidizer or kitchen appliance (in batches, betting on the dimensions of your unit for safety), or use Associate in Nursing immersion liquidizer to puree soup till swish. come back soup to pot and if required, gently heat to desired serving temperature. Stir in 0.5 (3/4 cup) of the reserved corn mixture, lime juice, and a couple of tablespoons cut cilantro. Season to style with salt, pepper, and flavoring. Toss remaining 3/4 cup corn with lime zest and a couple of teaspoons cut cilantro. Serve soup, screw-topped with a number of spoonfuls of the corn mixture, and an additional sprinkling of Cotija, if desired. 0 Response to "Mexican Street Corn Soup"